Published in Errors & Omissions on 02/01/2018 by Harry Lew, Chief Content Writer. Whew, 2017’s a wrap! 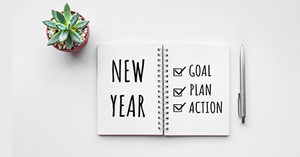 After a year-end breather, you likely are excited about attacking 2018 with renewed gusto. And you may be looking to raise your game by increasing your activity level, better managing your time, and/or increasing your closing ratios in the months to come. If working harder and smarter is on your to-do list this year, we commend you! But don’t just push to complete more tasks every day. Also resolve to raise your game when it comes to fully documenting your work results. Why is this necessary? First, because you want to be able to assess exactly what you achieve each day in order to tweak your performance in the future. Second, because documenting your work, especially the outcomes of your client interactions, will help prevent E&O insurance claims. You’ve no doubt heard of the classic example of life insurance agents getting sued because they didn’t recommend disability or long-term care insurance to a client who then got sick and needed that coverage. Alternatively, agents may have recommended such insurance, which their clients refused to buy, suing later anyway. In these cases, agents without written documentation have trouble mounting an effective E&O defense. Every time you recommend a product or service and a client accepts or rejects your advice. Every time a customer requests service and you complete the transaction successfully. Every time you speak to the client over the phone on matters large and small regarding their personal or business finances. In short, the need to document your client interactions is wide-ranging and never ending because the alternative can be highly risky from an E&O insurance perspective. Think about it. In a couple of years, will you remember the conversation you had with a client about increasing their life insurance coverage? Or will you remember that a prospect never got back to you with an important piece of information, resulting in his life insurance application never going through? Or will you recall your urgent advice for someone to increase his death benefit after having a mild heart attack? Of course, you won’t! Yet each of those memory failings might expose you to an E&O insurance claim if your client feels aggrieved by subsequent events. Problem is, the crush of current events can distract us from prior events. And even if it didn’t, human memory is remarkably fragile. Memories fade fast, and most people are powerless to prevent it. The only thing you can do is faithfully record the results of your work in the moment. Leaving it until tomorrow means it won’t get done. Another reason documentation is so important is it provides a backstop to errors or omissions that might cause future problems. For example, if a client asks for another $100,000 in life insurance protection, but you mistakenly write down $10,000, asking the client to confirm the change will identify the mistake now vs. later when there may be negative consequences. A third reason for being vigilant about documentation is that in the unfortunate event you get sued, the first thing your attorney will want to see is your complete customer file, including a diary of all interactions. In cases of he said/she said claims, the only thing standing between a successful defense and a large settlement will often be written documentation of your version of events. Finally, it’s important to remember it’s to your advantage in an E&O legal dispute to conduct yourself as a consummate professional. This includes being able to provide a well-documented case file that supports your attorney’s defense effort. Make sure your documentation is complete. This means recording whom you spoke with, the topic or topics you discussed, the outcome(s) of your conversations, and any needed next steps and completion dates. Commit to timely documentation. As soon as you complete a client meeting or phone call, update the file, using your electronic customer management system (CMS). Although more tedious to use, a printed form or logbook can also work well. Keep your records fact-driven. In other words, avoid including your own interpretations, theories, and speculations about client statements or behaviors. What’s more, never record anything in the file you wouldn’t want a plaintiff’s attorney or judge, let alone a jury, to read. Nasty comments about the client or his or her family members are never warranted, no matter how deserving they might be. Also avoid slang, texting abbreviations, or anything a colleague or member of your defense team won’t understand. Keep your comments brief. You may fancy yourself a writer. But if you go on and on in your case notes, you may end up annoying people you need on your side. Confine yourself to documenting key facts and outcomes to save everyone’s time. Be sure to document key events. For example, when a prospect or client refuses to follow your advice, make sure to enter that in the file. The same for when someone wishes to reduce coverage or cancel a policy. Finally, make sure to document all service requests and outcomes, including when exactly each request was successfully fulfilled. Finally, don’t forget that documenting isn’t just for client conversations. It also applies to every contact you have with your insurance markets, underwriters, and claim specialists. Whenever you have important conversations with others about the insurance benefits customers will receive (or not receive), be sure to carefully document outcomes in writing. In short, please consider making documentation a key 2018 priority. If you don’t do it consistently, resolve to begin doing so now. And if you’re already doing it, commit to doing it better. Because at the end of the day, documenting your work may spell the difference between a successful E&O defense and a court judgment that can chew through your assets and potentially put you out of business.